The early career of a master filmmaker. In 1925, Michael Powell , a film-obsessed 19 year-old, left his bank job and joined Rex Ingram 's itinerant film company in the French Riviera. Over the next three years, Powell acted in Ingram 's series of daft comedies, Riviera Revels (US, 1927), trying his hand at most of the jobs around the set, and learning as much as he could about the process of filmmaking. Back in England in 1928, he talked himself into a job as stills photographer on Hitchcock 's Champagne , a role he also took on the director's first talkie, Blackmail (1929). But Powell was keen to move on. After contributing scripts to Caste (d. Campbell Gullan, 1930) and 77 Park Lane (d. Albert de Courville, 1930), he was finally given the chance to direct a film on his own. Two Crowded Hours (1931) was a sensationalist thriller starring Blackmail 's John Longden and diminutive Cockney Jerry Verno, both of whom would cross paths with Powell again. The film was a modest hit, despite its tiny budget. His next film, Rynox (1931), an uneven but intriguing thriller with a neat plot twist, won the attention of critic C.A. Lejeune, who pronounced Powell - a little prematurely, perhaps - one of Britain's three most talented directors, alongside Hitchcock and Anthony Asquith . Of the 23 films Powell directed between 1931 and 1936, nearly half are still missing, despite a number of rediscoveries during the late 1970s and '80s. For an assessment of the merits of Two Crowded Hours , The Rasp (1931), Born Lucky (1932), The Girl in a Crowd (1934), The Brown Wallet (1936) and half a dozen others, we can rely on little more than a few stills, brief contemporary reviews and Powell 's own fleeting and often dismissive recollections in his autobiography. Those films that do survive, however imperfect they may be, offer fascinating insights into a developing talent, making the best of unpromising material and scant resources, and adding flashes of energy, wit and audacious style. Many of these films were 'quota quickies': cheaply made features, usually around an hour in length, largely produced or subsidised by the American studios in order to get around the requirement, introduced in the Cinematograph Act of 1927 , that British cinemas show a proportion of home-grown product. With a typical sale price of a pound a foot, budgets were almost ludicrously tight - scripts were hastily thrown together, and shooting was allocated little more than a few days. Within these strictures, however, an ambitious and individually-minded young director could work with minimal interference from producer or studio, provided he delivered the film on time and on budget. Hotel Splendide (1932) had fun with a daft story about stolen jewels and concealed identities, and stands comparison with Hitchcock 's own quasi-quickie, Number Seventeen (also 1932). His Lordship (1932) was a curious musical comedy, involving mischievous anarchists, an ambitious Hollywood starlet and a naive but well-meaning plumber, who has reluctantly inherited a peerage from his Socialist politician father. The Fire Raisers (1933) was, in Powell 's words, "a sort of Warner Brothers newspaper headline story", in which a debt-ridden fire investigator is driven to arson, and marked the beginning of a four film partnership with Leslie Banks . Despite a bigger budget and a strong cast, including Banks , Ian Hunter , Malcolm Keen and Ernest Thesiger , The Night of the Party (1934), was a disappointment, not least for its unwilling director, who described it as a "piece of junk". Nevertheless, a weak script was occasionally enlivened by Thesiger 's witty performance and some inventive camerawork. Also lacklustre, though intermittently entertaining, was Lazybones (1935), an implausible comedy about an insolvent aristocrat forced to work for a living. Something Always Happens (1934) was a lightweight but rather charming romantic comedy, with Ian Hunter engaging as a down-on-his-luck drifter who pulls himself, and the abandoned waif he adopts, up by his bootstraps towards success in the petrol station business, and ultimately wins the hand of his rival's lively daughter. By this time, Powell , when he could get his hands on promising material, was showing increasing confidence. Red Ensign (1934) was a plea for government support for British film production, under the guise of a story about a maverick shipbuilder forced to break the rules to save his industry - Leslie Banks starred in the best of his Powell roles, and one clearly modelled on Powell 's own self-image. The Love Test (1935) used the quest for the film industry's holy grail - fireproof celluloid - as the linchpin of a film of style and passion that effectively camouflaged a predictable romance plot. 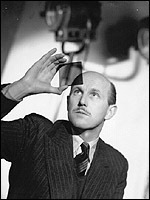 The Phantom Light (1935) was a slight ghost story boosted by a good comic performance from Gordon Harker (alongside a rather stiff Ian Hunter ), while Powell 's direction hinted at the feel for landscape and atmosphere that he would show in later works like A Canterbury Tale (1944), "I Know Where I'm Going" (1945) and Black Narcissus (1947). Crown v. Stevens (1936) was a tense proto-film noir, with Beatrix Thompson as a satisfyingly amoral femme fatale and future Hollywood lead Patric Knowles as her unwitting victim. Her Last Affaire (1936), the last of these works to survive, was Powell 's most prominent work so far, with the director confidently handling comedy and suspense in a Hitchcockian tale of a man attempting to clear his father's name, and in the process risking his own reputation. The surviving works from Powell 's apprenticeship may not number among his best - and before he died Powell joked that if any more 'lost' films were to reappear, his reputation would be in tatters - but they reveal a talented and fast-learning young filmmaker struggling to transcend the limited tools at his disposal, reaching for something magical and, just occasionally, brushing a fingertip or two against it. After five years of quota quickies and low key features, Powell 's apprenticeship was finally at an end, and he was rewarded by producer Joe Rock (who had financed 1936's apparently undistinguished The Man Behind the Mask ) with a project of his own choosing. The result was his most distinctive work to date. The Edge of the World (1937) was a poignant elegy to the death of a community. Inspired by the true story of the abandonment of the Hebridean island of St Kilda by its inhabitants, it delivered all that Powell 's earlier films had promised, and more. The director's spiritual affinity to the islanders and the desolate, craggy beauty of their unforgiving home was tangible, and the film began a love affair with the Scottish islands as passionate as Powell 's many more earthly affairs. It was The Edge of the World that brought the filmmaker to the attention of mogul Alexander Korda . Finally under contract to a major studio - Korda 's London Films - with the resources to support his ambitions, Powell , twinned for his first major film with Hungarian scriptwriter Emeric Pressburger , began the next phase of his career.